There was Warroad senior Brock Nelson, stickhandling at top speed, juking past one defenseman and sliding a laser-targeted pass through the crease, just out of reach of the other. At the receiving end was none other than Nelson’s longtime linemate Brett Hebel, who deposited the puck into the upper reaches of the net, all of it looking as routine and ruthless as a butcher chopping meat. It was as much a masterpiece as it was a goal, a scene Nelson and Hebel have painted countless times on rinks throughout northern Minnesota and beyond. It was also a highlight reel Roseau players have seen replayed too many times, starting when they were no older than pee wees. On this particular Sunday morning, however, Roseau players Kevin Erickson and Shane Omdahl were among those leading the cheers after the Warroad duo connected for yet another goal in a six-year partnership that has accounted for thousands of them. Hebel’s goal with 2 minutes, 36 seconds left in the third period helped Team Great Plains rally for a 4-4 tie with Team North in an Upper Midwest High School Elite League game at New Hope Arena. 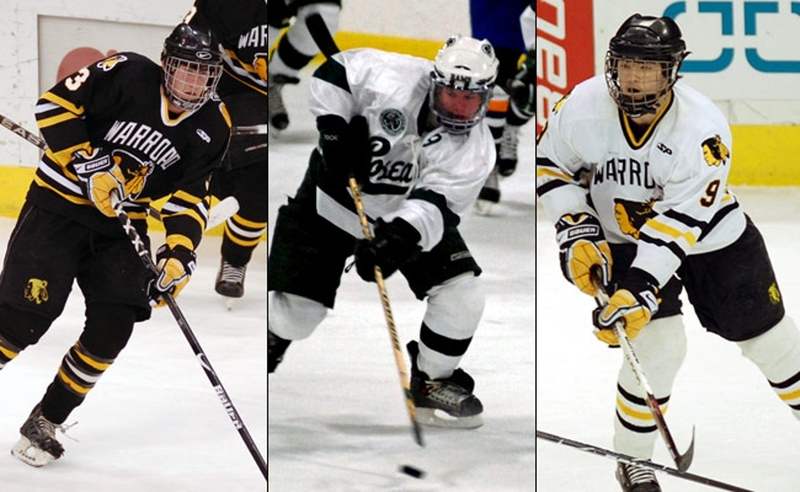 Warroad’s Hebel, Nelson and Carson Gray have forged an unlikely partnership with Erickson, Omdahl and Roseau senior Adam Knochenmus on the Great Lakes squad that, through Oct. 11, ranked second in the league with an 8-4-3 record and 19 points. Nelson, Hebel, Knochenmus, Omdahl and Erickson ranked one through five, respectively, in team scoring. “They’ve done that throughout their whole life,” Knochenmus said about the Nelson-to-Hebel connection, which amassed 66 goals and 139 points last season. Knochenmus, who has played on a line with Nelson and Hebel for much of the fall, has developed an acute appreciation for Warroad players who, from November through March, are the fiercest of foes. The Roseau-Warroad rivalry is as well-documented as it is intense. The New York Times is among the numerous publications to have made the trek to north central Minnesota in an attempt to develop an understanding as to why two towns so similar in size (Roseau has a population of 2,700; Warroad’s population is 1,700) and location (they sit 19 miles apart on Highway 11) and most everything else battle each other with such unbridled passion each winter. Indeed, there’s no better rivalry in a state filled with high-octane boys hockey feuds (Hill-Murray vs. White Bear Lake, Edina vs. Minnetonka, Hibbing vs. Virginia, to name three). As teammates this fall, that competitiveness has turned to selflessness. “There are other teams in this league that probably have more talent,” said Team Great Plains coach Scott Oliver, who guided Roseau to a Class AA state title in 2007 and will coach the Rams’ junior varsity this season. “But other than maybe (Shattuck-St. Mary’s) nobody has the kind of chemistry we have. While Knochenmus admitted that Roseau games against Warroad have a tendency to get a bit chippy, Oliver said he has been surprised by some of the sportsmanship he has seen. “The rivalry is always going to be intense,” Oliver said. “In the end Roseau is trying to win a state championship in Class AA and Warroad is trying to win a state title in Class A. Last season, Warroad beat Roseau by scores of 5-2 and 3-2. As for who has the better team this season, Knochenmus knows enough about the rivalry to not even bother trying to handicap it. “I couldn’t really tell you who is going to be better,” he said. “We have both great players. It doesn’t really matter on paper who has the better team.